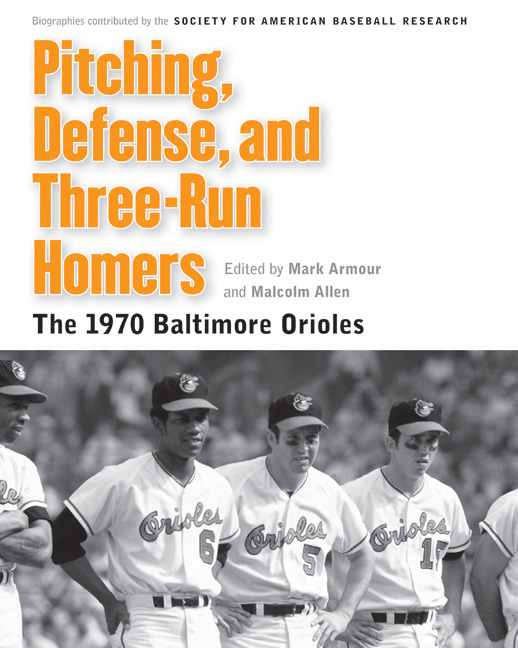 Editor's note: This essay is from SABR's "Pitching, Defense, and Three-Run Homers: The 1970 Baltimore Orioles" (University of Nebraska Press, 2012), edited by Mark Armour and Malcolm Allen. The seed that sprouted into the powerful Baltimore Orioles teams of the 1960s and ‘70s was planted by two baseball lifers who despised each other. Together they lifted the once-woeful St. Louis Browns into the ranks of the game’s elite. The Orioles were just one season removed from their sorry history in St. Louis when Paul Richards took over as both general manager and manager in September 1954. He proclaimed, “I’m running the show.”1 A lanky, hard-eyed Texan—a friend’s wife described him as “a cold fish”—Richards came from Chicago, where he and general manager Frank Lane had transformed the sagging White Sox into a consistent winner. Wearing his two hats in Baltimore, Richards exercised total control over baseball operations. The scouting and farm director he inherited, Jim McLaughlin, had come with the franchise from St. Louis. The farm system was a joke; the Browns had been too poor to invest in scouting and player development. But McLaughlin convinced Richards that he could do better with money to spend. It was a marriage made in hell. The two had just one thing in common: Each of them got up every morning, looked in the mirror, and thought he saw the smartest man in baseball. The 1954 Orioles played like the old Browns; they lost 100 games, the same as in their final season in St. Louis. It took Richards and McLaughlin six years to build them into pennant contenders. By 1960, when the Birds flew with the Yankees until the last two weeks of the season, the foundation for future success had been laid. Recalling the fractious partnership, McLaughlin said, “Where Richards and I saw eye-to-eye was on pitching, the priority it ought to have in building a farm system.”2 McLaughlin and his scouts found the pitchers; Richards and his coaches molded them. In 1960 the Orioles had grown five pitchers under age 23, called “the Kiddie Korps,” who recorded 58 of the club’s 89 victories. Baltimore also boasted the American League Rookie of the Year, shortstop Ron Hansen, and 23-year-old third baseman Brooks Robinson, who found his bat and finished third in the Most Valuable Player voting behind Roger Maris and Mickey Mantle. The Richards-McLaughlin power struggle eventually brought both men down. Richards was forced out of the general manager’s job after the 1958 season because the owners had had enough of his free spending and disdain for the chain of command. His successor as GM, Lee MacPhail, soon tired of refereeing between his two lieutenants. MacPhail said, “It got to the point where you were either a ‘McLaughlin player’ or a ‘Richards player’ in the organization, and there were decisions made on that basis.”7 Late in 1960 he fired McLaughlin. After leading the Orioles to second place in 1960 and third in 1961, Richards moved on to a new challenge: building the Houston expansion franchise, the first big league team in his home state. The Orioles won their first pennant in 1966 under Hank Bauer, one of several ex-Yankees MacPhail brought to the club. But after sweeping the favored Dodgers in the World Series, Baltimore slipped to a losing record over the next season-and-a-half. When Bauer was fired in July 1968, first-base coach Weaver took over. General manager Harry Dalton had identified the feisty Weaver as a comer soon after the bush league second baseman began managing in the minors at age 26. Weaver thought the organization had strayed from the fundamentals of the Oriole Way. With Dalton’s support, he brought the philosophy back to the forefront. Richards’ little manual had been expanded into a bigger book that told a player what to do from the moment he walked into the clubhouse. “It was a detailed, position-by-position, definitive system of how the game should be taught and played,” farm director Lou Gorman said. “Every player in the organization had to read and absorb the manual, at every level, and play the game on the field the Orioles way.”8 There was another manual for instructors and a third one for scouts. This was not an original idea; Branch Rickey had standardized instruction in the Cardinals and Dodgers organizations. But the Orioles stuck with their way through a succession of owners, front-office executives, and managers. “The Oriole Way was ‘never beat yourself,” catcher Elrod Hendricks said. “And that’s why we won so many close games. We let the other team make mistakes and beat themselves, and when the opportunity came we’d jump on it.”9 It was the gospel according to Paul Richards: Most games are lost rather than won. As important as the techniques were the men who did the teaching. Many of the Orioles’ instructors were career minor league players like Weaver, but they made up a roster of future major league managers: George Bamberger, Billy Hunter, Clyde King, Jim Frey, Darrell Johnson, Joe Altobelli, and Cal Ripken Sr. The front office was a farm system for future general managers: Dalton, Gorman, Frey, Frank Cashen, Hank Peters, John Hart, and John Schuerholz. The first links in the winning chain were the scouts. Jim McLaughlin was one of the first to insist on using cross-checkers rather than betting on the opinion of a single scout. He devised a circular chart that he labeled “The Whole Ball Player.” The top half of the circle covered the player’s visible tools: speed, arm strength, hitting. McLaughlin told his scouts to learn about the bottom half, traits that “cannot be seen with the eye:” intelligence, teachability, family background, habits. He brought in FBI agents to teach scouts how to conduct a background investigation and sent his minor league managers to seminars designed by Dale Carnegie, the author of How to Win Friends and Influence People, to improve their communications skills. The Orioles were one of the first teams to give players psychological tests. Throughout the system, instructors taught that the Oriole way was a winning way. “There are two ways to play,” farm director Don Pries said. “One team goes to the park to play the game. The other goes to the park to beat you. We went to the park to beat you, not just play the game.”12 By 1970 the Orioles’ farm clubs had recorded eight straight winning seasons. "We had the right players, no doubt about it, but we stressed those strong fundamentals in our minor league system for years,” Weaver said later. “When guys came up they were well-schooled in the Oriole Way. They knew what they had to do.”13 Ron Hansen, Curt Blefary, Al Bumbry, Eddie Murray and Cal Ripken Jr. were named Rookies of the Year. The prospects graduated to the big club like waves breaking on the shores of the Chesapeake Bay. Some of the farm system’s products were traded in deals that added key pieces to the club. The most famous one sent Pappas to Cincinnati for Frank Robinson. Ron Hansen and Pete Ward brought Luis Aparicio, the shortstop on the ’66 championship team. 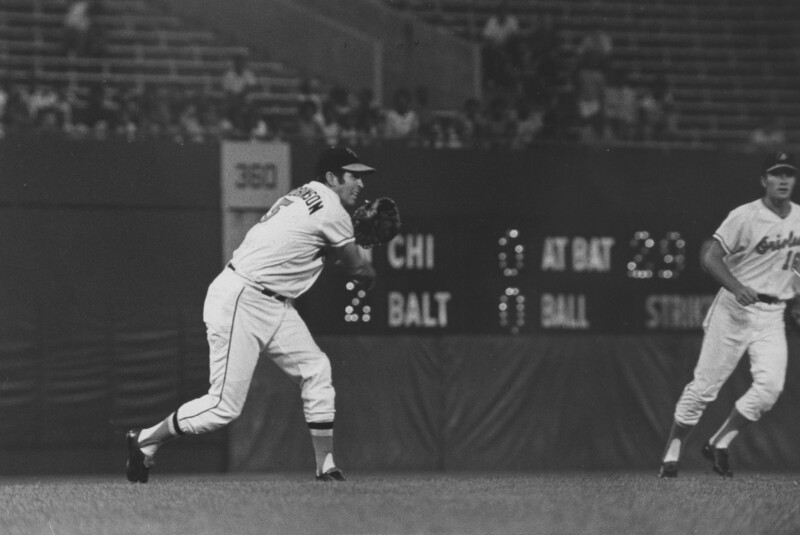 Mike Epstein, a first baseman blocked behind Boog Powell, was exchanged for reliever Pete Richert; Jack Fisher for reliever Stu Miller; Curt Blefary for Cy Young Award winner Mike Cuellar; Tom Phoebus for twenty-game winner Pat Dobson; Merv Rettenmund for pitcher Ross Grimsley; Rich Coggins for Ken Singleton. The Oriole Way produced dramatic success. After Weaver became manager in July 1968, the club staged a second-half pennant run before finishing second behind Detroit. The next season Baltimore won 109 games and another pennant. Then another, plus a World Series, in 1970. Previewing the 1971 season, Frank Deford wrote in Sports Illustrated, “By consensus, the Orioles are not only the best team, but the best organization—with the best players, the best manager, the best system, the best front office, the best morale and, definitely, the best chances…. The team may or may not be a dynasty, but it is accepted as the model of a dynasty, as the Rickey Cardinals and Dodgers were, or the Weiss Yankees.”14 But even after a third straight pennant in ’71, the club was never recognized as a dynasty because it won only one of three World Series. The next generation—Don Baylor, Bobby Grich, Al Bumbry, Doug DeCinces—was already rising through the farm system. Over two decades, from 1964 through 1983, the Oriole Way produced at least 90 victories 16 times, with only a single losing season—the best record in the major leagues. 1 Chicago Tribune, Sept. 15, 1954, C1. 2 Kevin Kerrane, Dollar Sign on the Muscle: The World of Baseball Scouting (Fireside/Simon & Schuster, 1984), 145. 3 Earl Weaver with Berry Stainback, It’s What You Learn After You Know It All That Counts (Doubleday, 1982), 235. An extensive description of the Thomasville camp is in John Eisenberg, From 33rd Street to Camden Yards (Contemporary Books, 2001), 71-76. 4 From an untitled, undated manuscript by Paul Richards, in the author’s files. 5 Donald Honig, The Man in the Dugout (Follett, 1977), 201. 6 Jim Russo with Bob Hammel, SuperScout (Bonus Books, 1992), 41. 7 Eisenberg, From 33rd Street to Camden Yards, 70. 8 Lou Gorman, High and Inside: My Life in the Front Offices of Baseball (McFarland, 2008), 42. 9 Eisenberg, From 33rd Street to Camden Yards, 212. 10 Terry Pluto, The Earl of Baltimore (X-S Books, 1982), 96. 12 Eisenberg, From 33rd Street to Camden Yards, 233. 13 Boston Globe, April 4, 2010, 10. 14 Frank Deford, “The Best Damn Team in Baseball,” Sports Illustrated, April 12, 1971, online archive.